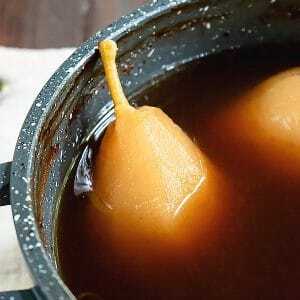 Poached Pears are a very seasonal treat and can be infused with various flavors. Today’s poached pears are infused with 5 spice seasoning. Besides the poached pear recipe, you can watch how poaching is done. Poached Pears are cooked/stewed peeled dessert pears. The pears can be poached in whole, half or quarter. The Cooking water can be flavored in various ways and includes always sugar as well. In this poached pears recipe, I used a homemade version of the 5 spice blend. Yet the most well known poached pears version is the one with red wine or white wine, which is a traditional dessert from the Beaujolais region (popular wine-growing region). However, in France, I have always only tasted a spiced version of poached pears. In fact, if you google for poire pochée, you will see what I mean to say. So, while red wine poached pears are rather rarely served in France but common in the English speaking countries, I figured it was about time to introduce you to new poached pear flavors. I am not a fan of red wine poached pears but I go crazy for spiced poached pears! My aunty always spiced hers with vanilla and cinnamon, that’s when I picked up a taste for this dessert. Later on, when I learned about 5 spice, a Chinese spice blend which is common in the West, I added some of that to my pears. 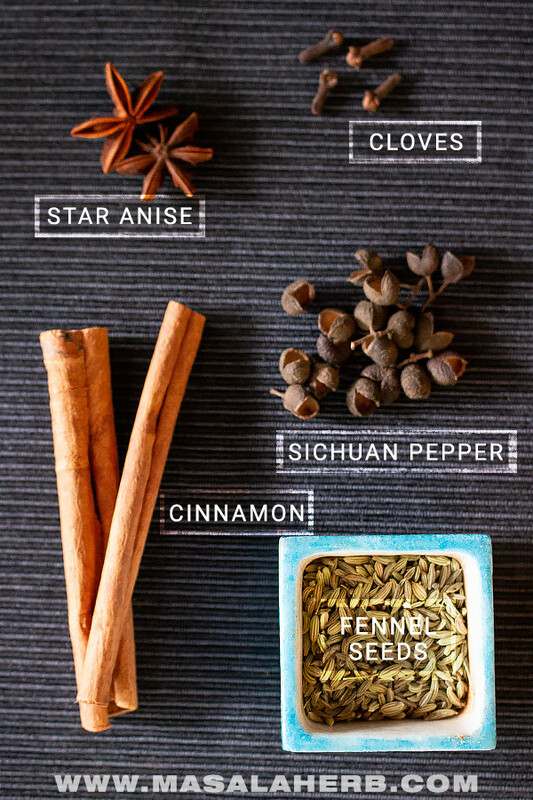 Five spice is such a versatile spice blend. It goes really well with citrus fruits but also with autumn fruits. Today’s spice poached pears include lemon juice and lemon zest, so the 5 spice blend enhances all the citrus flavors threefolds. For the pears pick crisp and firm pear varieties such as Bosc Concorde or Forelle because you don’t want your pears to fall apart while stewing them. I like my pears semi-sweet if possible because I like my desserts, generally speaking, less sweet, so the sweetness level of your pear is something you might want to consider as well. For the sugar, I used brown sugar because I like my brown sugar. I find it more suitable for my dessert taste palate. Yet, you can use regular sugar too if you prefer. Pear poaching is simple and not rocket science. Spices cook in Water with the sugar to create a syrup. Pears are added and cooked soft. You can choose to poach the pears as a whole, or in half or in a quarter. Some people like to take out the seed pod too, I leave them because they don’t bother me as much as apple seed pods do. I have a couple of uses for my spiced poached pears and you can try them out if you feel like it. Regular poached pear with some of the syrup served hot or cold with ice cream or just by itself. The poached pears canned in a sterilized jar to enjoy another time in the future. I recommend Bormioli Rocco clear Glass Jars for that, these lead-free quality jars can be washed in the dishwasher too. That way you will have a private little stash and the pears get infused all the more! Poire Belle Helene with poached pears. Basically chocolate covered poached pears with vanilla ice cream. For the 5 spice poached pears, try with chili chocolate or Mexican chocolate and some orange zest. Infused pears cut and stuffed in a Crepes. Cut poached pears in your breakfast porridge, rice pudding or cream of wheat. Poached pears cut and used as a filling for Strudel or in an Almond flour Tart. Served with Whipped Cream. The poached pear syrup mixed with some water in a glass and enjoyed as a cold beverage or with vodka or rum. The poached pears taste great with nuts such as almonds, walnuts, and hazelnuts. 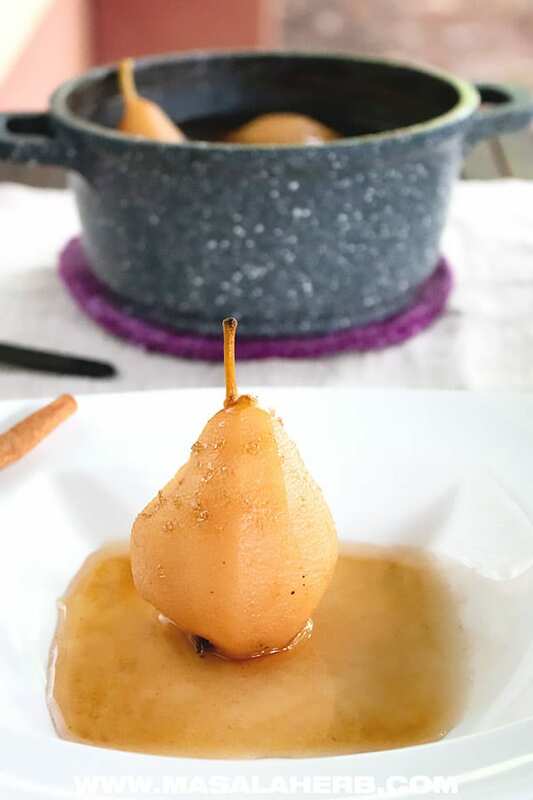 Flavorful Poached Pears with 5 spice blend. This Chinese spice blend is popular in the west with dessert recipes such as this pear dessert. 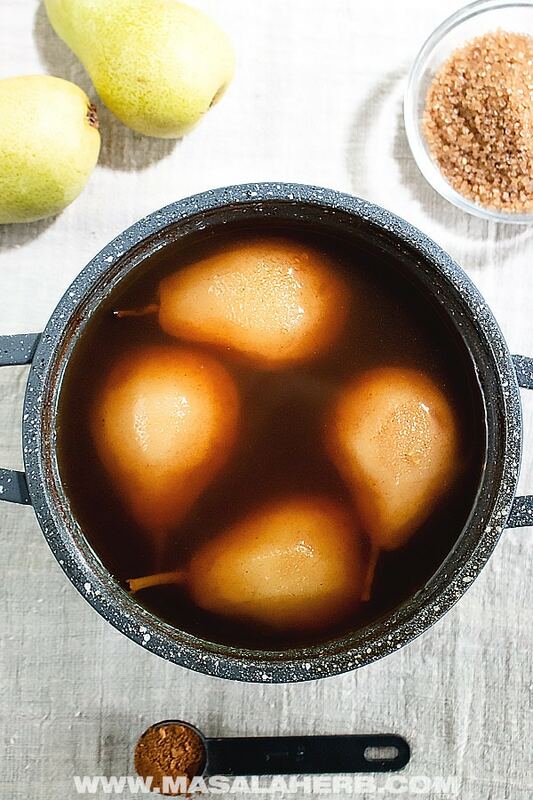 The spice blend adds a comforting sweet flavor to the pears by infusing the fruits equally. Scrape of the lemon zest from the clean lemon skin. Cut the lemon in two and take out the juice. Keep aside. Peel your pears but leave the stem on. Heat up a pot with the water. Add the sugar, lemon zest, 5 spice and cinnamon stick to the pot. Mix the content and bring to a boil. Place your pears into the cooking syrup. Cook the pears soft, this might take somewhere between 15-20 mins depending on the pear variety and size. The pears should be cooked but not fall apart. Once cooked let the pears and syrup cool. Take out the cinnamon stick and strain if you want if you don't like the lemon zest pieces. Brown Sugar results in a deeply flavored pear syrup, but you can use regular sugar or powdered sugar too if you prefer. Use pears that are firm and equal in size. See in post for pear variety suggestion. Dear Reader, how are you going to enjoy these poached pears? Poached pears are why I just can’t wait for fresh pears. Adding this one to my collection. 5-spice is a spice blend that I love to smell, but I just don’t know how to use it. Now I do. Thanks Helene. 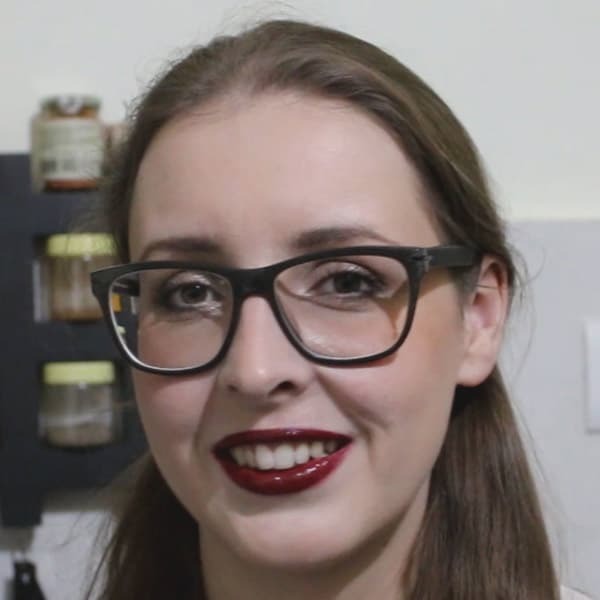 Great, I bet you will like this recipe. I know what you mean, 5 spice has so many uses but half the time we don’t use it because it is quite special in taste. The 5 spice works really well with the pears because the lemon zest is rounding up the flavors. I like to cut my poached pears and mix it into thick greek style yogurt. I also add some of the pear syrup for flavor. 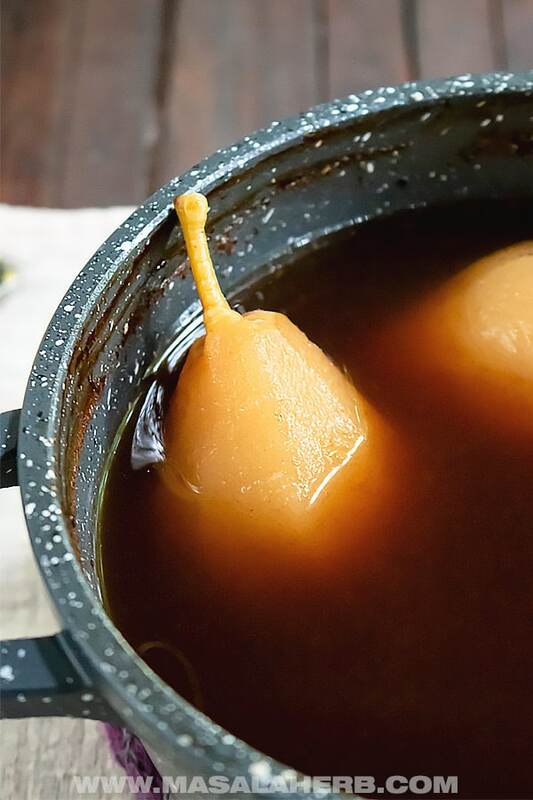 Hi, this may be interesting you: 5 Spice Poached Pears - How to Poach Pears!